Like a cancer, Multiple Sclerosis can be sometimes categorized as "benign". It doesn't mean it won't hurt you or really that it's any different from "regular" MS. It's misleading, in my opinion, to call any form of MS benign unless a person had one or two exacerbations and then it stopped altogether for the majority of their lifespan. Like the people who are autopsied and found to have had MS but nobody ever knew it and they never showed any symptoms. Benign MS is not something that can be diagnosed up front. You can't go to the neurologist because you've been so dizzy you thought you were on an old Batman TV set, and have him tell you "You have Multiple Sclerosis, but it's the benign type and you will not suffer any major neurological damage for years." It's diagnosed, rather, in retrospect. I feel I've had MS for an eternity (and to my 9-year-old son, it has been forever since I was diagnosed when he was 6 months old). Nine years isn't long enough to judge whether my MS is benign or not, however. The clinical definition of Benign MS is "10 years since diagnosis and an EDSS score of less than or equal to 3". It does not mean one doesn't end up in the hospital taking steroids for days at a time, or that you don't occasionally have to wear depends, or be confined to a wheelchair, or have vision or speech problems. What it does mean is that, despite the attacks, your body is able to repair the damage and rebound from these attacks to assume a normal or close to normal level of neurological function. Perhaps this ancient symbol should represent Benign MS. The Ourobouros Sun seen here is the ultimate ancient symbol of power that eternally consumes and renews itself... kind of like MS with myelin. 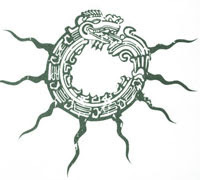 Image Credit: Quetzelcoatl sun t-shirt design - based on the Aztec ourobouros. Original t-shirt design by Primal Future Media. That is so misleading and MS is so unpredictable that I am scared to allow myself the luxury of even considering adding "benign" as a prefix to my MS. It can change at any moment. I could have a whopper of an attack and sit in my electric wheel chair that I have "just in case" and never get back up again. Not that there's anything wrong with that... It's just silly to even have the category of "benign" for MS. Until I die, there's no point in assessing it one way or another, right? And once I do, I'm not really going to be pondering the question any more. I mean, if it's more accurate to assess these things in retrospect, one shouldn't really jump the gun and describe the course of my disease until it's done having it's way with me, right? So, in conclusion, in order to give my readers a definitive answer about the type of MS I have, I should wait until the 10th anniversary and see what my EDSS score is and than kill myself so there's a definite end to the entire process. (Don't worry, Mom, I'm being sarcastic here). Otherwise, at year 11 or year 15 or year 29, I may just have a smack-me-down-good relapse from which I cannot get up, and that would blow the whole "benign" theory right out the window. In my opinion, there's nothing "benign" about this horrid disease and it's all one big crap shoot as to what it ends up doing to you. Hopefully, there are researchers out there somewhere who are interested in learning how the myelin can take a major hit and the body can repair it to near perfection in persons who have "benign" MS. If the pharmaceutical companies can't replicate it, tho, it probably won't be looked at. So the money making cogs of the MS wheel turn. Until next time ~ may you be flare free or at least be having a good day. Thanks for all of your support in spreading the MS Blogger word out there. I happen to know that there are researchers studying the remyelination mystery. How do I know? Because one those researchers is a very good schoolmate friend of my Sweetie's and we've discussed his research. It seemed very ironic when he came to D.C. for a medical conference just shortly after I was 'officially' diagnosed and we talked alot. BTW, I'm smake dab in the middle of an attack requiring the dreaded 5-day IV drip. Aargh!! And it had been 2 years since I'd had such a relapse deserving steriods. But, you know, I'm still able to walk (although kinda sideways, leaning to the right, and shaky if I stand in one place too long), still able to type (and gaining some sensation in my left hand), still able to see clearly (no optic neuritis this time around!!! ), and still able to formulate thoughts (although with mixed words on occasion). All around I guess it's all good. But I do hate the steriods. I'm so glad to know there are folks like your friend out there that are researching this stuff. I mean, if they can't find a cure for MS it would seem that the next best thing would be to focus on how the body can repair itself. I remain optimistic about what the future of research holds, after all, a good guinea pig should root for the home team! The pharmaceutical companies have no interest in duplicating anything, like myelin repair. If they repaired the myelin, they'd have a cure. If they had a cure, they wouldn't be paid eternally for their medications. As far as I can determine, pharmaceutical companies exist only to treat the symptoms. Nick, those have always been my suspicions as well. There could very well be a known cure for all or some of these dreaded chronic diseases, but no way is a pharmaceutical company going to allow that to happen and stop the gravy train. Instead, try LDN (low dose naltrexone). If my symptoms got any worse, that's what I'd be on. Currently, I take no medication. I was diagnosed with MS almost 4 years ago (had optic neuritis on the right eye at age 27) and so far have had no other relapses or even any signs of MS. Anyway, I read what people write and their symptoms and it really frightens me to think that I could possibly go through that. You're right about pharma companies and research. They really need to get to the bottom of this disease and learn how to cure it. Although I find it difficult for this to happen with the millions that pharmaceutical companies are making on MS drugs. I am currently taking Avonex and have been doing so for about 3 years. I wonder if it's making a difference??? I guess I just don't want to chance it and will continue to take the weekly injections. Why change what has worked?? so far. Are you on any of the MS drugs tickledpink?? Well Good luck to you and everyone reading this. I do hope I remain this way (w/no symptoms), although I know I can't count on this being the case.